If you want to make sure that your relationship with any new housemate /boyfriend /girlfriend /goat (hey, I’m not judging) will be able to stand the depths of any arguement, go to Ikea. If you know me pretty well, you may know that one of my secret passions is furniture and design. I like things that look good, and that have a useful function. Well, don’t we all really? You’ll also know that I have more than once said how much I bloody well love Ikea. I feel like I should correct this now. I do love Ikea. But only as a friend. No, wait. I like it for the glasses, for the plates, for the little homeware stuff that is just so damn cute and you throw into a giant yellow bag. (Excellent ploy there, you Swedish minxes, that makes me want to buy more!) And of course, no trip to Ikea would be complete (or even started sometimes – the amount of times we went at lunch just for this) without the cheap and dirty hot dog you buy after paying for your stuff. Ooh look at that hot dog. I almost want one for breakfast and its not even 10am yet. What was I saying? Oh yes, Ikea. So its great for things like the candles and photo frames, but I will never (I hope, oh how much I hope!) go there for furniture again. So you grab a trolley (for some reason located at the other side of the warehouse) and start to try and pick up all these bits. For my bed, I had to get three boxes for one item, then the slats and the main beam. Which were found in isles 12, 13 and 23. You find the boxes, and lug them onto the trolley that doesn’t stop moving (erm, brakes?) and try to wheel the trolley to the checkouts without everything falling off (I’d love to put all the barcodes in a nice order, but it was enough to get them onto the trolley!) or without running into a child. 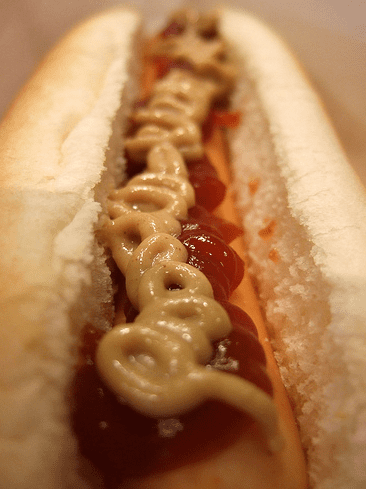 You pay, and probably eat one of those delicious looking hot dogs (oh just look at it!) before trying to get this in your car. If you have a normal car (i.e. small hatchback type) you do not have a chance in hell of fitting anything other than a few tealights and maybe a CD rack in the back. We went in my dads Mitsubishi Pajero which isn’t exactly a small car. After much pushing and pulling the boxes about, we managed to make everything fit in, and Max and I squeezed into the smallest corner. We got back to the flat and managed to get everything into the corridor, and Dad went back to the pub, muttering curse words under his breath (because it beats shouting it into the phone at me while he was waiting at the car) We ended up having to break open some boxes to carry some of the stuff upstairs because it was just too heavy to carry. We now have a hallway full of wood. I’d love to say that things between us are fine despite the Ikea shopping experience, but we’ve not put the things together yet, so ask us then! It’s all together – and we’ve not killed each other in the process, have we! If we can survive an IKEA outing, we can get through anything. And to think someone said we’d never be able to live together!